Franchisee profile: Committed people-to-people individuals, from all backgrounds who, combined with our guaranteed turnover, can deliver a service second to none in their chosen territory, either hands-on or fully managed and supported by the Dublcheck brand. WE GET THE BUSINESS FOR YOU! Be in business for as little as £8,750 or choose a guaranteed turnover of up to £120,000 per annum. With over 100 franchisees nationwide, and many more areas and opportunities available, you too could benefit from the proven Dublcheck system. Dublcheck's unique franchise system is a proven way to build a successful business in a multi-billion pound industry. Scotland is prime territory for Dublcheck franchisees with small and medium sized enterprises (SMEs) accounting for 99 per cent of all enterprises*. By providing a reliable, quality service to this largely neglected sector UK-wide, Dublcheck has become one of the UK's fastest growing companies, according to the Sunday Times and Virgin Fastrack 100. Dublcheck is seeking franchisees and a Master Franchisee for key territories including Edinburgh and Glasgow. 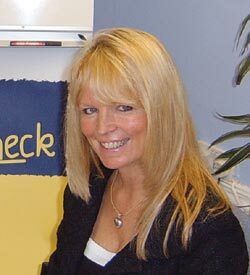 'Dublcheck is the franchise where you don't need to be able to sell,' Carol Stewart-Gill, Founder, reiterates. 'You can start with a turnover of £12,000 per annum if you want to run your business hands-on while retaining the security of your current position, or up to £500,000 per annum if you want to run a management business. Dublcheck is a wholly owned UK company with a 100-strong network. A number of its first franchisees have sold their businesses for a significant profit and new franchisees continue to enjoy the benefits of being part of Dublcheck. From a guaranteed turnover of £12,000 and running the business hands-on, Barry and Karen have expanded their franchise into a fully managed business. They aim to match and then beat top achieving franchisees turning over in excess of £250,000. Ken Holland, franchisee, agrees: 'Dublcheck offered the best package - the guaranteed starter package gives me revenue and got me off the ground. Also, the training provides a British Institute of Cleaning Science qualification. My franchise became a limited company in June 1999 and gradually increased to just over £200,000. Mike and Wendy Masser are currently turning over in excess of £200,000 having decided to grow their business quickly. 'Dublcheck came up with new contracts very quickly, after which the business has grown through referrals and contracts I've found myself,' Mike explains.